There are some novels that know exactly what they are, and stick to it. 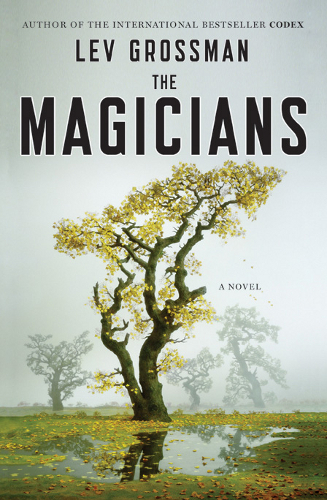 Then there are novels like The Magicians. It’s been described as adult Harry Potter –but if you go into it with that expectation, you’ll be surprised. At its heart, The Magicians is a story of character, not genre or plot – Quentin, a fan of Narnia-analogue (I say that, but the similarities are so constant that it’s almost a one-to-one comparison) Fillory. He enters a secluded world – that of the US’ school for magicians, Brakebills. And magic... Isn’t so fun. They spend half a year learning how to internally calculate what affects their spells, and how to account for it – but the magic isn’t the focus here. Nope, it’s still Quentin – and as you can guess, Fillory definitely ties into the finale! As I said, The Magicians doesn’t know what it’s trying to be – and I don’t mean that necessarily as critical. It’s a rather eclectic mix of magic classes and student intrigue, character study and crossover, secondary world fantasy. Yes, there’s something for all tastes – but there are some flaws because of that! For one, the Fillory scenes are definitely weaker, and though they give the impression of an adult in Narnia – too old for childhood fantasy, and a good deconstruction – they nevertheless required more time to build up setting, in my opinion. Secondly, a lot of time is spent on learning about magic – and for the later parts of the book, little of what we learn really comes up, and compared to some of the spells the students were firing off in the academy (or failing to), it seems slightly odd. For all that, Quentin’s an engaging character for modern fantasy: perennially unhappy but looking for happiness, and occasionally stumbling without a clue (! ), it’s a nice contrast to our more competent Rothfuss and Sanderson-esque heroes (who are equally fun – but need their balance). It’s nice to know that Fantasyland isn’t just populated by paragons and monsters. Sometimes we need a dose of the ordinary, too. So, would I recommend the novel? Yes – but with a few caveats. What are they? Don’t expect the traditional, that Quentin’s development comes quickly and to look out for it, and that this would be much better with a sequel. Oh look. It does have one. I read this one, and did not like it at all. Then I (forgetting I'd read it the first time) read it again, and got really into it! So, I think you're right, you just have to go into it without any expectations. And you're right, I thought that the whole Narnia aspect was definitely a one-to-one comparison. I haven't read the sequel yet, but I plan on getting to it eventually. Thanks for the review! For me, Quentin was too ordinary, and I didn't like him at all. Also the whole Fillory matter sounded too plagiary to me (although it probably wasn't the author's intention). I was a little disappointed by the book, although I admit some parts are good. @ BookJunkie: Glad to know someone agrees - I think it's the fact that it's neither one subgenre nor the other, and it's a sort of blend you have to take as 'character-driven story', rather than with the expectation of a particular pattern. I haven't picked up the sequel yet either, but I plan to - if only to see whether it fulfils its promises to the reader. @Pepca: To be honest, I like these 'everyman' heroes as well, though Quentin was a little disappointing in Fillory, I think. Fillory was, I think, an intentional similarity - or at least that's how it came off to me. That's true. Although I personally didn't much care for the Fillory scenes (and the ending involving them), I do think it had potential with more development - you have an adult in a seemingly-childlike world. I do think, however, that the Narnia-analogue might not have been the perfect choice, as you mention - the Beast was far more interesting as an 'extension of something much larger from another dimension' as they intimate, than his true identity. Still, I'll be reading The Magician King: the Magicians had a lot of potential, and I'd like to see if Fillory improves. I agree that it's not an Adult Harry Potter, and that it's not quite clear what it is instead - but sometimes I wonder whether it wasn't actually intended to be Adult HP. I love ordinary heroes, and have been known to openly support villains so it's not by principle that I object to Quentin's personality: his cluelessness, the way a, blooming? sexual life plays such a great role in shaping his relationship with his friends, the way they dabble in magic that is almost like doing drugs... I'd be okay with all that, if it had felt part of the story. Real, if you will. But the truth was, I could not sympathize with Quentin (and, again... I did sympatize with Jorg in Prince of Thorns!) and with the dilapidated, directionless life he lead before Fillory steps in. It read as if every instance was there to mark a line between a more normal youth and a darker, rebellious, dispondent teenager. And while I realize that Fillory must have been some kind of tribute to Narnia, I thought it was overdone - less like a tribute, more like a copy. A copy with a few scenes added in to make it look adult. I agree fully with you comment about balancing: the classes were so long, and then all the actual plot happens in Fillory, and we know nearly nothing of how it's supposed to be, to work. Well, I think I should stop rambling now! That's enough commenting... But it's because this time I had actually read the book! Thanks for sharing your great review! I love to read your opinions. Hm, interesting! Personally, I rather liked Quentin's rather clueless transition - though I agree, some scenes did seem artificially intended to show a distinction. Regarding Fillory, I agree that it was so overwhelmingly similar, but I interpreted that as the point - though didn't think even for a Narnia-analogue that it was sufficiently fleshed out. I mean, the Martin revelation wasn't really built up to at all, and the Watcherwoman's turn felt slightly irrelevant - we'd only heard a little about her before. All seemed too much like last-minute-backstory time! Still, I think the copied nature was pretty essential, as it went into the slightly stranger aspects - for example, why the humans could never stay. I do think there were plotholes, actually - I know they say that they were never taught 'combat' magic, but it seems to me that pretty much anything they learned could have been relevant... And then they ignored it to concentrate on a newly created 'magic missile'. Really? Bit of a disappointment IMO.